So I had mentioned I picked up one pack from the Baseball Card Shop, and it was a... 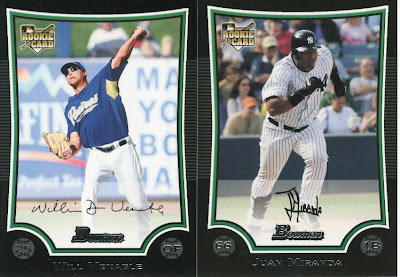 Bowman Jumbo pack. Nothing too exciting, at least not to me anyway. I did get an Adam Lind base card which is always nice to get. 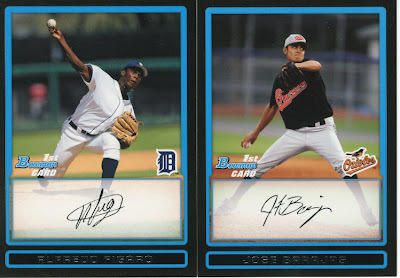 I like jumbo packs simply because you have 3 shots per box at an auto, which I didn't get but still like the odds. I scanned a couple of each type of card to show everyone in case you haven't seen them yet. 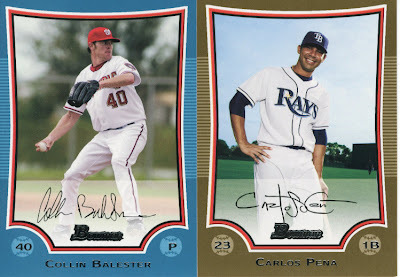 The design on the base cards is par for the course in the Bowman sets. The first year and the chrome cards look like video game screens to me, between the design and the lettering it just makes me think of video games. The font reminds me of Pac-Man. You can judge for yourself though. 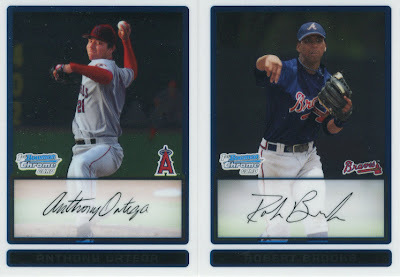 I also stopped by Target yesterday and they had no 2009 UD Series 2, or Topps Series 2. They did have one full box of 2009 Bowman, and by full I mean all 24 packs were there so I know the micrometer had not been used yet. Hmm.... that is a tale for later. I finally got my eBay auction that was purchased on April 30th. It only took 20 days for them to sort it out, and in the meantime I got one of the cards I was waiting for from someone for free. Wonderful. I will show you my mailday at some point over the weekend. I'm going to the game tonight, and Sooz is as well but she is going for work. So things may be a bit quiet around here til late tonight or tomorrow. I'm sure most people are going to be outside enjoying the weather and the holiday weekend so I doubt you'll miss us that much. 'Cept for Captain Canuck, he loves us so much.